Bushmeat is commonly eaten in parts of Africa. But now it’s turning up in American cities. 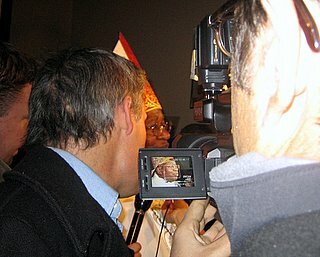 A profile of the controversial Catholic Archbishop Emmanuel Milingo and his movement for married priests. Some scientists say that global warming is changing the world’s longest lake and threatening its main resource: a tiny fish. Why don’t Americans care as much about climate change as the rest of the world? Carbon offsetting is everywhere, but what does it mean? The world will need to adapt to a changing climate, but not every country can afford it. Many people across the US and Europe have started to minimize their carbon footprint by eating local. But the environmental impact is mixed. A story about a community of scavengers who pick through Tijuana’s dump and live in its shadows. The All-American Canal leaks. It seeps water into a Mexican aquifer and has for decades. Now, the US government wants to line the canal to stop the seepage. Health workers are trying to stop the spread of HIV across the US-Mexico border. The Mendes Brothers have recorded some of the most influential Cape Verdean artists from their basement studio in Brockton, Mass. But the studio is closing its doors. A Tagalog language video is a sleeper hit in the Filipino-American community. But it’s also a little controversial. New European chemicals legislation raises health and safety standards around the world. Iceland’s homogeneous population is getting a new influx of immigrants. Iceland’s debate over commercial whaling. The viability of hydrogen power as a replacement for gasoline is being tested in Iceland. But it’s taking longer than expected. A TV show for kids that gets them to eat veggies and exercise.